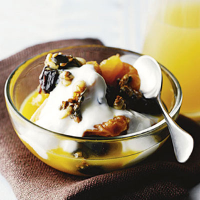 This wholesome fruit compote makes the perfect start to the day, topped with low-fat yogurt and crunchy honey-coated seeds. Place the dried fruit in a medium pan and pour over the orange juice. Bring to the boil, cover and simmer gently for 10 minutes, until the fruit has softened and started to swell in size. Set to one side and allow to cool. Meanwhile, place the seeds in a dry frying pan and toast for 2 minutes until lightly golden and starting to pop. Remove the pan from the heat and stir in the honey. The honey will sizzle at first but keep stirring until the seeds are coated. Leave to cool slightly to allow the mixture to become crisp. Divide the fruit between 6 bowls and pour over the orange juice from the pan. Top each with 1 tablespoon of yogurt, and scatter with the seeds. Make your own fruit mix – try figs, prunes and dates, and add a sliced banana at the end of the cooking time. Make up double quantities of fruit and crunchy seeds; they will keep in airtight containers in the fridge for 3-4 days.